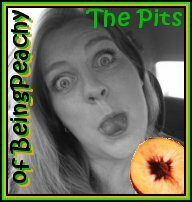 The Pits of Being Peachy: Don't be a dog, save a puss today ! Don't be a dog, save a puss today ! Hello darlings. I have been rowing against the current and doing a ton of things that haven't been as fun as sharing stories with you good looking people. I have missed you. I tried to answer everyones emails personally over the last few months and as I said in each of those, I am not gone for good just on a hiatus. Still deep in the middle of real world shark infested undertow, it's really nothing more than what we all do everyday, but right now I have had to focus the majority of my energy in the boring grey landscape of the real world instead of on here with you indigo ultraviolet glitter slinging darlings. So what brought me back to write this post today? Well it came to my attention Tuesday. About 5 weeks ago, we were adopted by a litter of kittens that were more like teenagers. It became clear that the actual owners had no interest in them and the mother of the cat that had them was suspected pregnant again and would attack them. 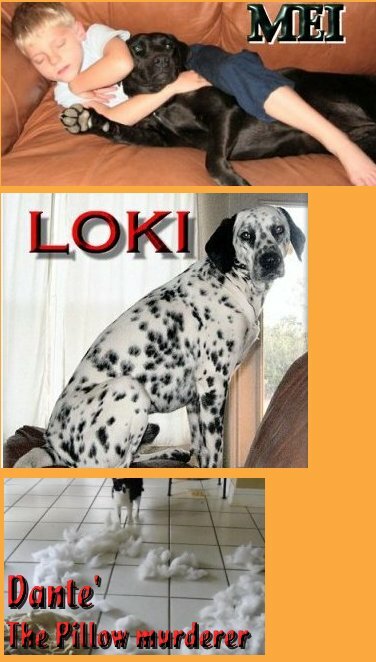 You guys already know I have my 9 yr old black lab rescue Mei, and the Dalmatian rescue named Loki who had multiple surgeries after he had his pelvis crushed and his femur dislocated and fractured. Then of course the evil 8 year old Feral cat named Dante who has made it her lifes mission to hate me and tear up or use anything that belongs solely to me as her person restroom. ( she also hacked my facebook and when I outed her on this very blog read here, she retained the best legal council and sued me for slander). Needless to say our pet plate was already over capacity as you can see in this picture. BAM 4 new very attentive and playful abandoned kittens show up. I knew they were WAY to old to be prime candidates for adoption if we took them to a shelter. Even though I am a dog person, they didn't ask for this, and I couldn't drop them off where I knew they would end up being behind bars for life or even worse, put down. If you doubt me watch this video of them that keeps us entertained when the cable is out. The downside, 4 more mouths to feed, and the mere mathematical fact that 4 cats will be 12 cats in 4 months, which will turn into 46 cats in 9 months. We were trying to find solutions. So I contacted the Humane Society of South Mississippi even though it was an entirely different county. There's not much as far as choice. Via a series of emails and phone calls, we were able to get the 4 strays spayed and neutered. It was at that point that the universe broke into a deep smile which caused all the stars to align. This shelter, not even in my county, has taking in 39 pets this week from a horrible hoarding situation. They were overwhelmed from Katrina and worked years to reunite thousands of pets with their families. They turned no one do, even when there was no electricity or running water for over a month. Then factor in the oil spill. Everyone on the coast has been repeatedly slammed time and time again, yet they have figured out how to barely keep their heads above the water with the help of volunteers and donations. They are warriors for those with no voice. It's pretty amazing. Yet they helped us by helping those strays. How, I don't know but they pulled off some magic. While there I found out they along with the rest of the world was in the running for a $20k grant from the ASPCA. The way to vote was go to the website, click on contest, and highlight MS- South Mississippi Humane Society by clicking on it, then entering your email and captcha hit enter. In a little bit, you will get an email to confirm your vote and you have to click on the confirm link in that email otherwise it doesn't count. Yesterday I found out about it. I logged on, and they were in 4th place of the entire planet. WOW ! Hello and MEOW! our little bitty gulf is in 4th? Mind boggling. Also this means if I can get them 6k to 7k votes by 2pm on Monday they will get the much much needed grant. 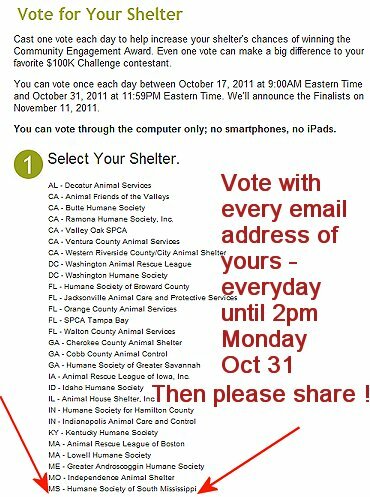 A) You can click HERE to be taking to the ASPCA voting link. 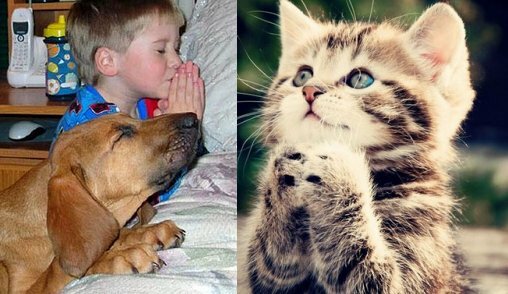 B) click on MS- South Mississippi Humane Society, then enter your email and the catpcha and submit, each email address you have can vote 1 time per day. C) whatever emails you used, make sure you check them and then click on the link in the email so your vote gets counted. D) PLEASE ASK YOUR FRIENDS, FAMILY, TWEET, FACEBOOK IT. WHATEVER pass on the word, the contest ends at 2pm on Monday October 31. we are 6k away from 1st place. I have begged enough now I present animal begging. Here's the link again in case you forgot or don't want to scroll back. I promise it's so easy a Peach could do it. Remember you can vote daily until Monday at noon, and we are in third place, needed 6k votes in 4 days. I have faith in you guys. NOW GO DO IT ! SANDI!! The web page is all screwy - I keep trying to click on your shelter but nothing lights up! And then the captcha "image" is one of those broken up pictures that shows NOTHING. Dammit...I have four email addresses I'mma use every day til Monday...but I need the stupid website to COOPERATE WITH ME. GRRRR! I've tried it in Google Chrome and then Explorer - and neither browser shows the captcha picture. That blows!! Hey I figured out that they calculate all votes for each day and then clear the cookies late at night. so they halt the ability to vote, it should be ok by the time you read this. we are in third and the top ranker is really hitting a lead. remember EACh email can vote once a day and it ends monday so we need to cover some serious ground, please tweet, g+, facebook, or whatever you can and ask your people to share with their character. At last check, they were in 3rd. Done and posted to FB too..